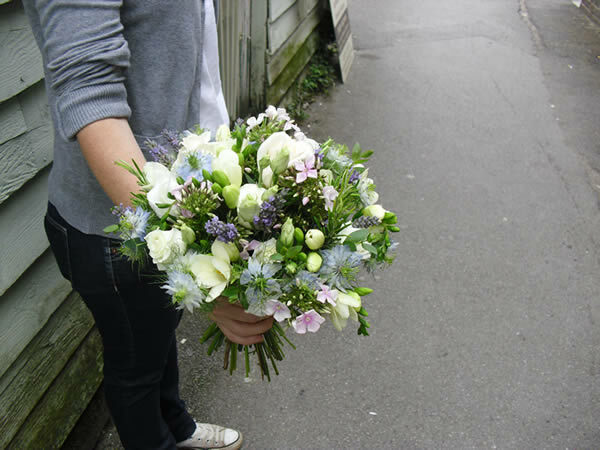 The Blacksmiths Daughters florist shop has in the last 15 years, established a very strong presence in the market town of Petersfield in Hampshire. 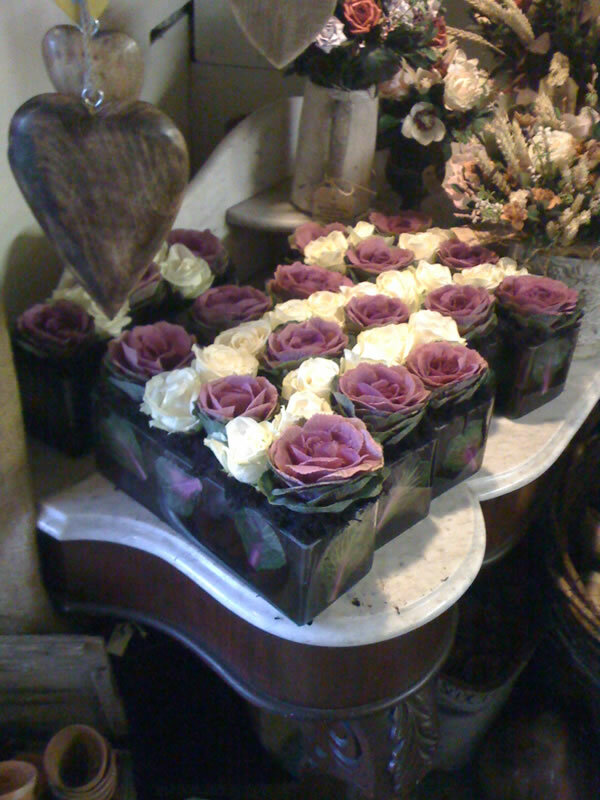 With a strong reputation for good old fashioned quality service coupled with the most gorgeous bouquets and arrangements, unusual cachepots and containers, this flower shop is a totally unique experience. 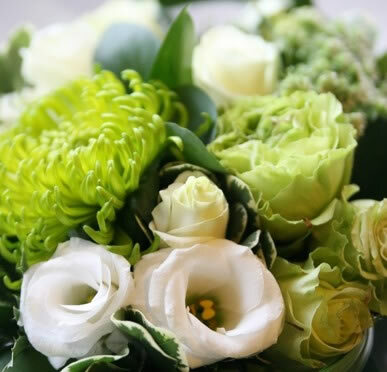 Hands on owner Master Florist Kristina Cousen and her great team of florists will provide you with stunning flowers for weddings, parties and events, thoughtfully made sympathy tributes, and handtied bouquets and arrangements to delight and amaze whatever the occasion. 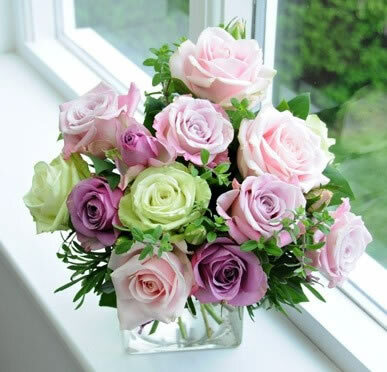 We deliver the same day to Petersfield and the surrounding areas and our Posy Express service delivers our flowers to your friends and family Nationwide. Click on Posy Express for all the details. 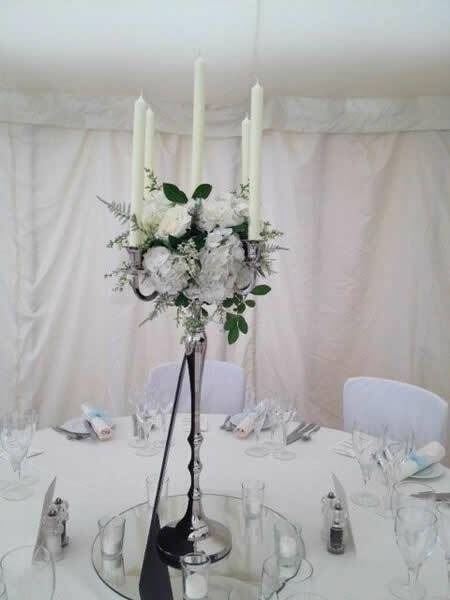 We have a wide selection of vases, candelabras and containers for hire should you want to go it alone, along with an extensive range of vintage china and are happy to order in your stems and advise on quantities. I have been a florist for some 20 years now. I think that I can honestly say its a real pleasure to be part of The Blacksmiths Daughter. When I moved to Petersfield 13 years ago, I remember so well walking into this amazing flower shop and thinking ‘THIS is where I want to work’ – and have now been here 12 years – is it that long!!. 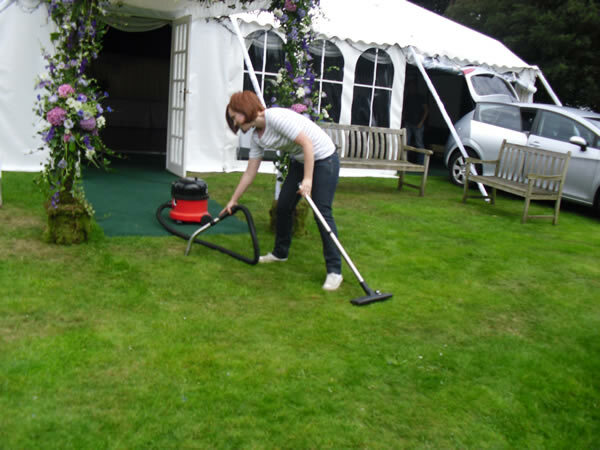 A part of my job which I love is working closely with Krissi on the weddings - usually one or more a week! 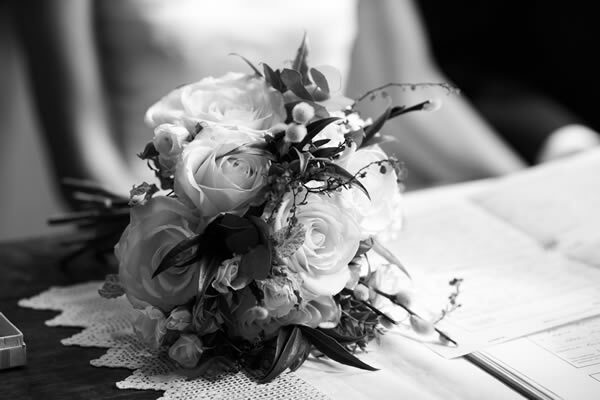 She is so good at listening to the Brides and interpreting their ideas, that I am then able to create the perfect bouquet or arrangement for them. I have worked for Krissi for 11 years as part of the dedicated and passionate team. 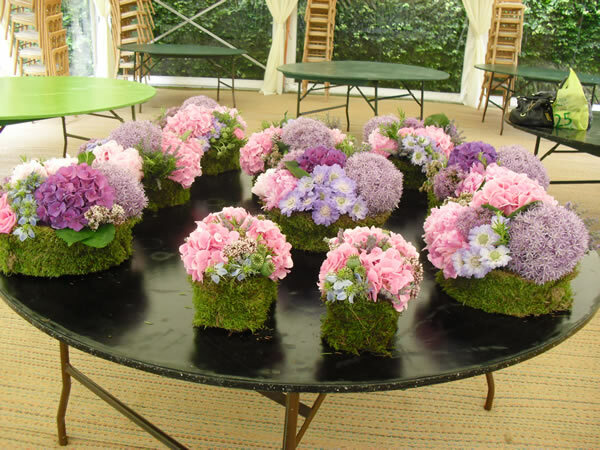 With the high quality and wide range of superb flowers, my artistic talents are allowed to flourish and progress thus creating the most wonderful arrangements for our clients, many of whom we have got to know well over the years. This has enabled me to emphatise and interpret their wants and needs. I started work here after completing a 2 year Floristry course at Sparshalt, and I just love being part of a team that is passionate and committed to beauty and creativity. I love the richness of colours and textures of all the fabulous flowers and plants that Krissi buys from Covent Garden Flower Market and direct from the Dutch Auctions. 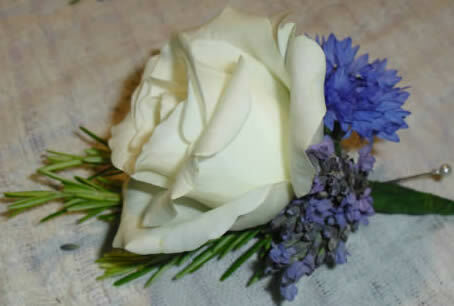 Its a great feeling to put these flowers together in a bouquet that says ‘I Love You’or ‘I'm Sorry’ . However, I think the thing that I love most about working here is the complete uniqueness of everything that leaves the shop. We love weddings. 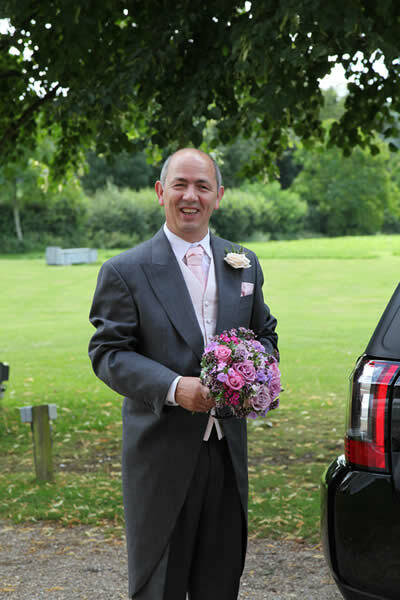 Your joy and excitement is infectious and ripples through our fantastic team of florists that work with total dedication to make your wedding day truly memorable. Bring us your vision, be it clear or cloudy, bring your pictures and your wish list and we will work with you to create the most stunning arrangements and beautiful Bridal work. 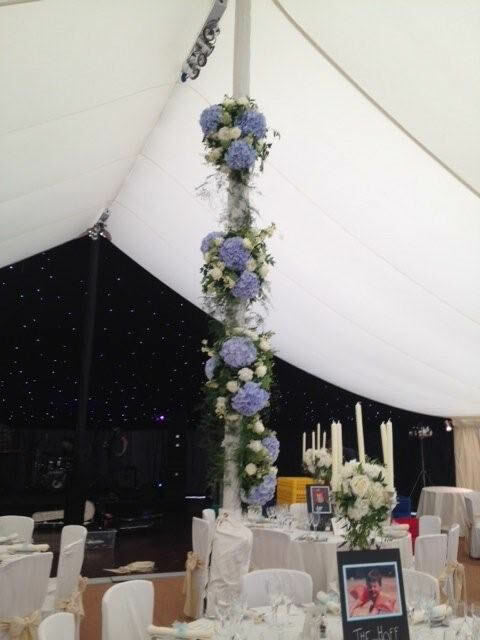 We have over the years built up a very enviable reputation and keeping in mind that ‘we are only as good as our last job’ we will make your flowers breathtaking, - thats a promise. When you are at a loss for words flowers speak for you. 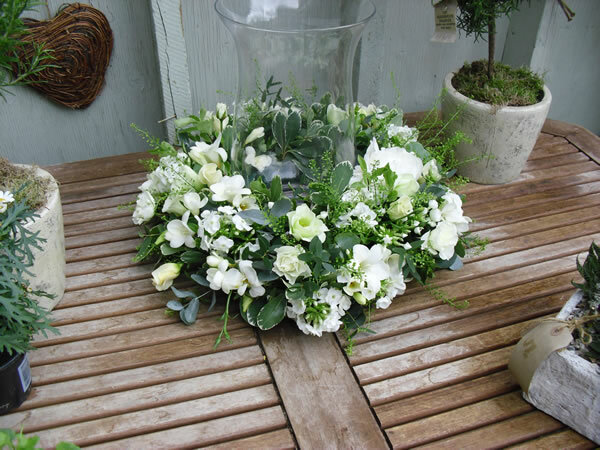 All of us here know from personal experience the importance of a caring tribute and we are here to listen, advise and work with you, We can help you choose the appropriate flowers, colours and design. We have a wealth of experience and we make sure that your tribute is exactly what you want. We liase with your Funeral Directors to ensure that your tribute is in the right place at the right time. 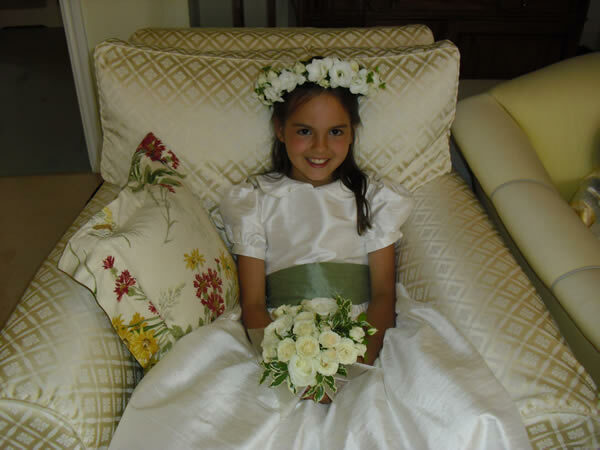 If you have chosen a natural burial we can dress the casket at the Chapel of Rest. 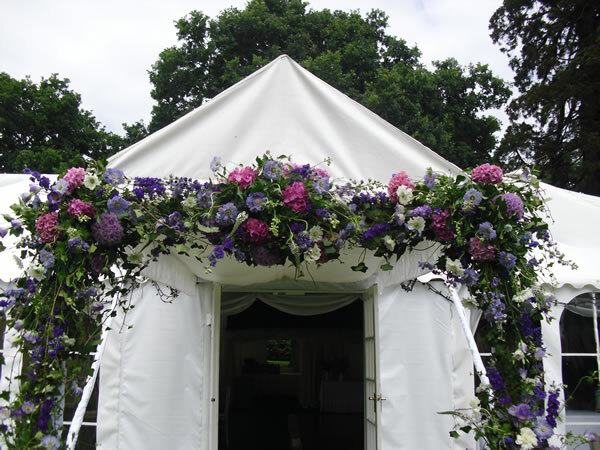 With our passion for flowers and our vast experience The Blacksmiths Daughter will create bespoke designs inspired by you that will transform your venue and wow your guests. 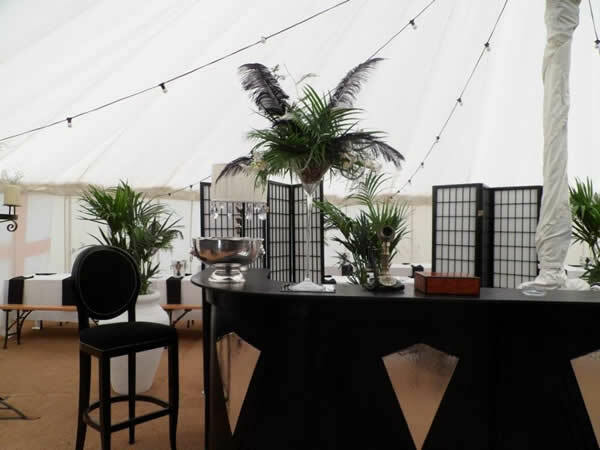 Our fantastic team here will work with you to create the look that you want and ensure that your party is a memorable one. We have the most fantastic and exciting traditional and contemporary designs for Christmas this year. Fresh Blue Spruce Garlands dripping with oranges,cinnamon, chillis and cones for your mantles and stairs, all handmade here to your measurements and incorporating your colour scheme. Fresh topiary trees of glossy locally grown foliage in dutch stone containers. 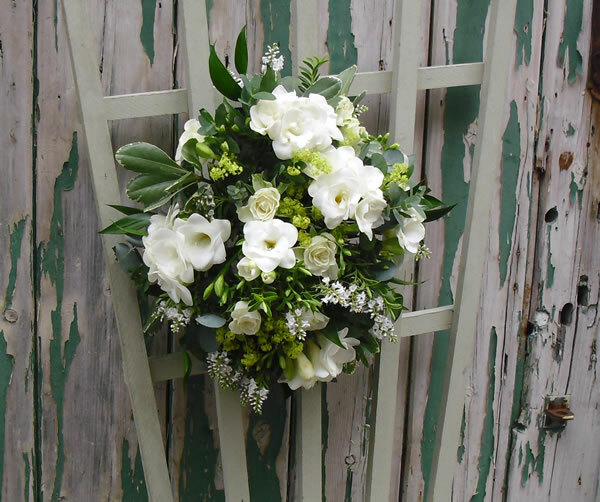 Beautiful garlands to grace your door, impress and welcome your guests. 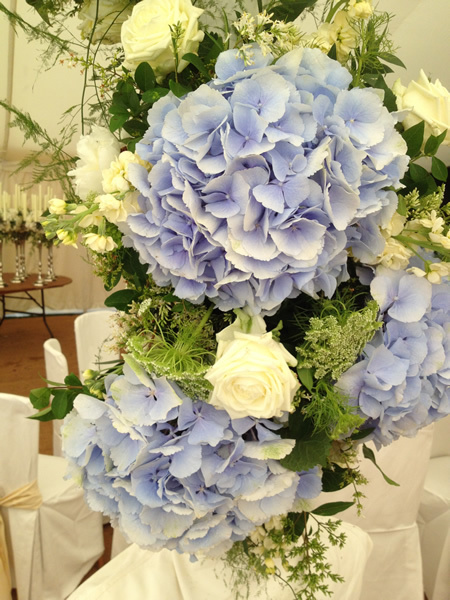 Thank you so much for providing such beautiful flowers for our wedding. 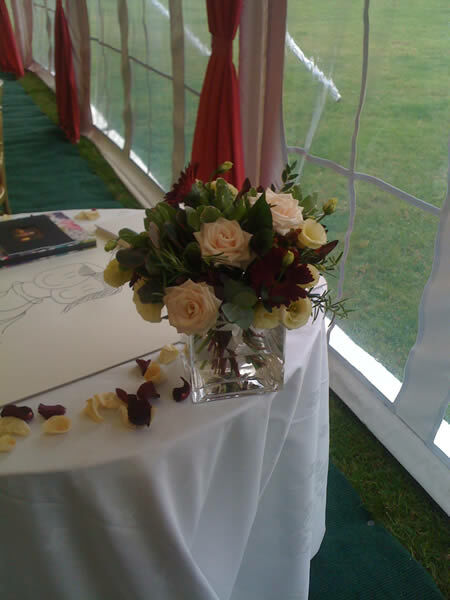 The bouquets were exactly what I had hoped they would be, the buttonholes and corsages fantastic - the table arrangements, perfect! The cake top and cake table were even better than I had expected. You really made our wedding look so very special. Krissi, thank you for being so patient with a Bride who had no idea what she was doing! Your hard work is so appreciated and your contribution to our day made such a huge difference. Thank You! I just wanted to say thank you SO much for your amazing service! 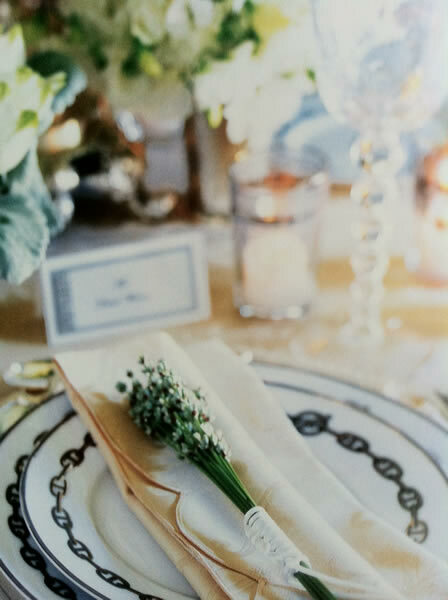 I absolutely loved the flower arrangements you used for our wedding. They were well beyond my wildest dreams and hopes for the colours, the blues were exquisite, the purples and pinks worked so well and everything was just PERFECT!!! 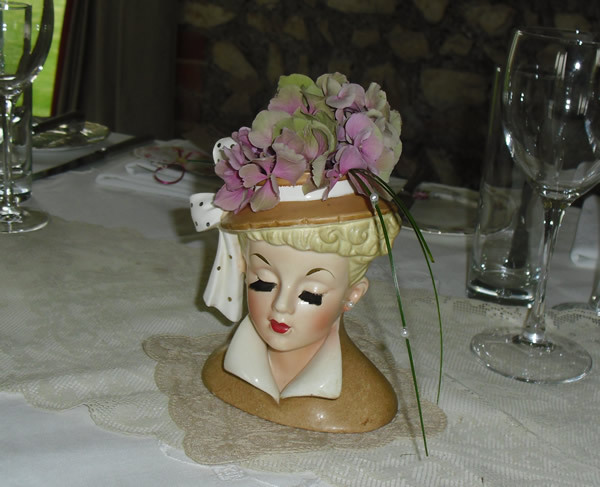 The table centres in the martini vases were fantastic, everyone was commenting on them and couldn't wait to take them home with them! My bouquet was so beautiful, absolutely stunning, have set my Mum the task of drying it so I can keep it forever! The Bridesmaids bouquets worked perfectly with their different coloured dresses and so created the look I was after! I know I was very specific and maybe a little difficult with wanting lots of colours, but you made it work and it totally paid off! 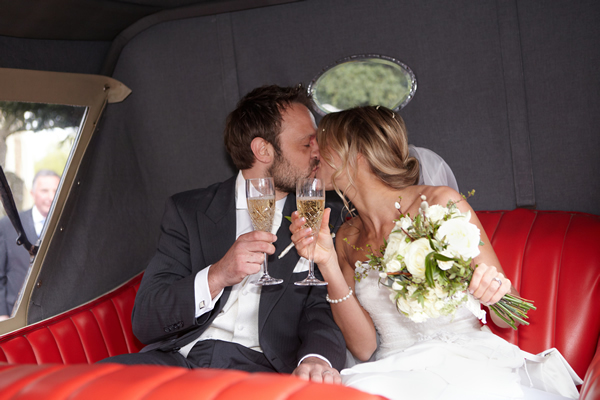 Thank you for working with me in order to create the perfect day! The Bouquet you made for me was so perfect in everyway. What a joy it was to work with you Krissi and your fantastic team. A big thank you from us all, you made our wedding stunning, from the buttonholes to the marquee poles and everything in the church - outstanding. You really did provide us with a fantastic service from start to finish. Charlotte and Edward. Farbridge, Chichester. 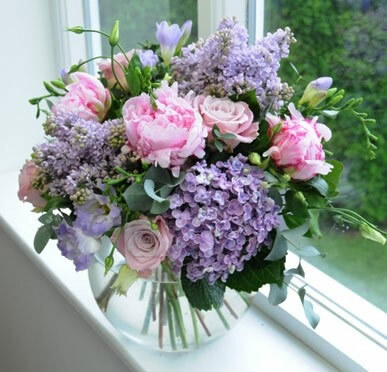 Not only do we offer a same day delivery service to Petersfield and the surrounding areas in our van, you can also send our stunning bouquets to friends and family nationwide. 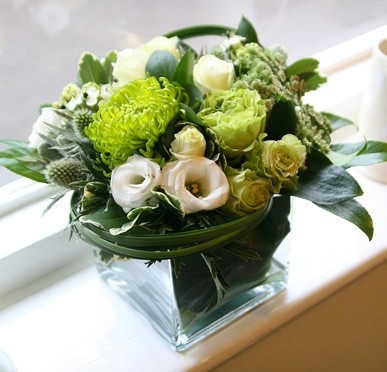 Using our trusted courier service your bespoke bouquets are sent overnight for next day delivery . This service is available for delivery Tuesday through Friday. 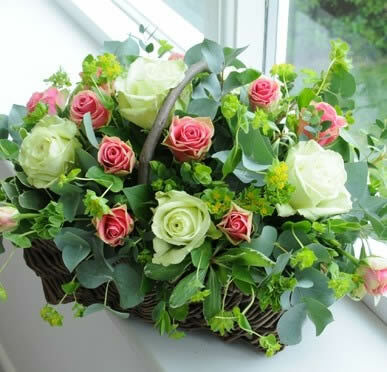 Each bouquet for our Posy Express service is made here at our shop, beautifully wrapped and packed in our flower box. You can add your own card and if you wish, a lightweight present to accompany the gorgeous bouquet.